Atrial flutter represents a group of arrhythmias defined by the presence of a large circuit around a central obstacle, which can be a fixed anatomical structure or a functional electrophysiological line of block. Generally, the unique anatomy of the atrium is an important determinant of the location of a flutter circuit. The most common form is best known as typical atrial fl utter and is characterised by the presence of classic saw-tooth flutter waves in the inferior leads of the ECG. The presence of atrial flutter usually suggests an underlying predisposition to atrial fibrillation, which will eventually be identifi ed in most of these patients. Indeed, atrial flutter is generally initiated through a transitional phase of atrial fibrillation. The circuit for typical atrial fl utter is located in the right atrium and is defined by well described anatomical barriers. 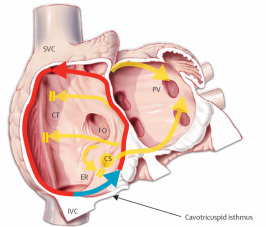 In simple terms, the circuit can be viewed as a broad activation wavefront that rotates around the anteriorly located tricuspid annulus in the counter clockwise direction.